Charlotte Henry (March 3, 1914 – April 11, 1980) was an American actress who is best remembered for her roles in Alice in Wonderland (1933) and Babes in Toyland (1934). 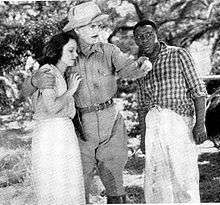 She also starred in the Frank Buck serial Jungle Menace (1937). Charlotte Virginia Henry was born in Brooklyn and began modelling at a very early age and was always fascinated by the theatre. Her family were astonished when, at only 14 years of age, she was cast in an important role in Courage, a hit Broadway play in 1928. The following year, Charlotte's mother brought her to Hollywood. She repeated her part in the movie version of Courage (1930) and enrolled at Lawlors, the school for professional children. Some of her classmates were Frankie Darro, Anita Louise and Betty Grable. Junior Durkin, who had worked with her in Courage, suggested Charlotte for a play he was appearing in at the Pasadena playhouse. By then, she had appeared in two more feature films: Huckleberry Finn in 1931 and Lena Rivers in 1932. She appeared as "Mlle. Kitty" in Charlie Chan at the Opera (1936). Around that time, Paramount was looking for a young girl to play in their new movie version of Alice in Wonderland, and over 6,800 were auditioned. A Paramount talent scout saw Charlotte in the play and arranged a screen test on a Monday morning. One-week-to-the-day later, Charlotte Henry began filming the high budget classic. The studio's press department made much of her uncanny resemblance to the character as it appeared in the original Tenniel drawings. An anxious movie-going public awaited the costly feature. A new young star was expected to emerge. The 1933 picture garnered unanimous praise for Charlotte. The huge cast was impressive, but their make-ups made it hard to tell who was who. It did poorly at the box office. The effect of Alice on Charlotte's life was more than the usual story of an actress ruined by a negative association. She was also typecast, but in a most peculiar way. In an interview, Henry disclosed that from the very first week of shooting, she became aware that others around her had simply lost sight of her as a person. "I no longer existed as Charlotte Henry", she said. "With that costume, I was transformed in their minds to the creature they had read about as children. My identity was gone." Paramount loaned her to MGM for Babes in Toyland with Laurel and Hardy. Despite the success of that particular film and perhaps Charlotte's most remembered role, they released her. However, she continued to make movies, although the lower budgets of some of the productions sometimes let her down. She made around 30 films, some as the star but more often in supporting roles, mostly between 1930 and 1937 followed by more modelling, and then five more in 1941 and 1942. Discouraged by the low quality of the work she was being offered, in her own words: "I simply lost interest." Charlotte retired from the movies and moved away from Hollywood to San Diego where she ran an employment agency with her mother, then became executive secretary for 15 years to the Roman Catholic Bishop of San Diego, Charles F. Buddy. She was happily married to Dr James Dempsey and continued with her acting, appearing in several stage productions at the San Diego Old Globe Theatre. Her car licence plate, in true looking-glass style, read "ECILA". She died of cancer in 1980. The San Diego Union newspaper carried the obituary and noted that she was buried at Holy Cross Cemetery and was survived by her husband, Dr. James J. Dempsey and her brother, the Reverend Robert E. Henry of St Paul's Episcopal Church in Ventura, California. ↑ Lehrer, Steven (2006). Bring 'Em Back Alive: The Best of Frank Buck. Texas Tech University press. pp. xi–xii. ISBN 0-89672-582-0. ↑ Biography, Charlotte Henry website, tiscali.co.uk; accessed July 9, 2015.